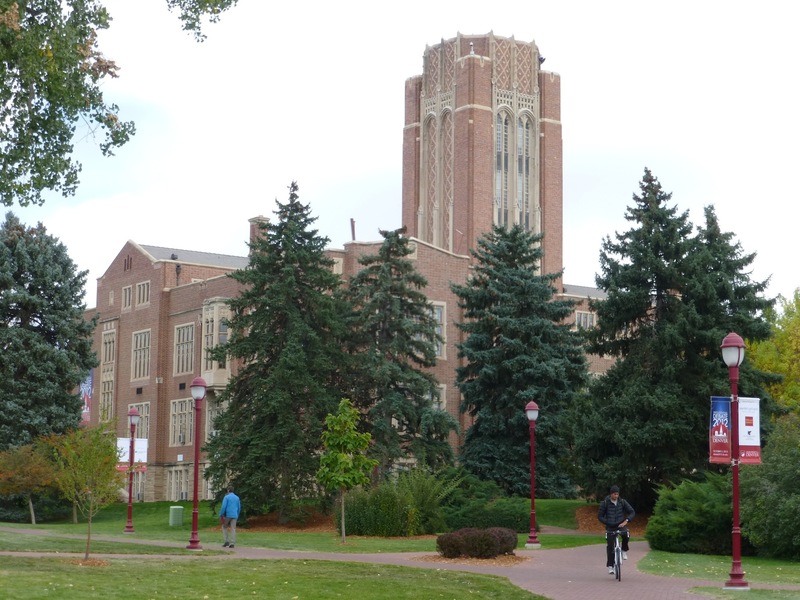 This is a great school for students who want a real campus in an urban environment and are sports-oriented, either to watch or to participate in. Although this is in the city, it’s a safe area, and campus is well patrolled and gated; students and faculty swipe IDs to get through the gates at the entrances. A major street runs through campus, but the students seem to like it. “It actually ties the campus together,” said our tour guide. “Students hang out there.” In First Year Odyssey, students learn how to get around the city and use it as a resource. They can’t have a car as freshmen, so they really have to learn SEPTA (which stops just up the street) and the buses. “We take the B+ student who plugs away and has potential. 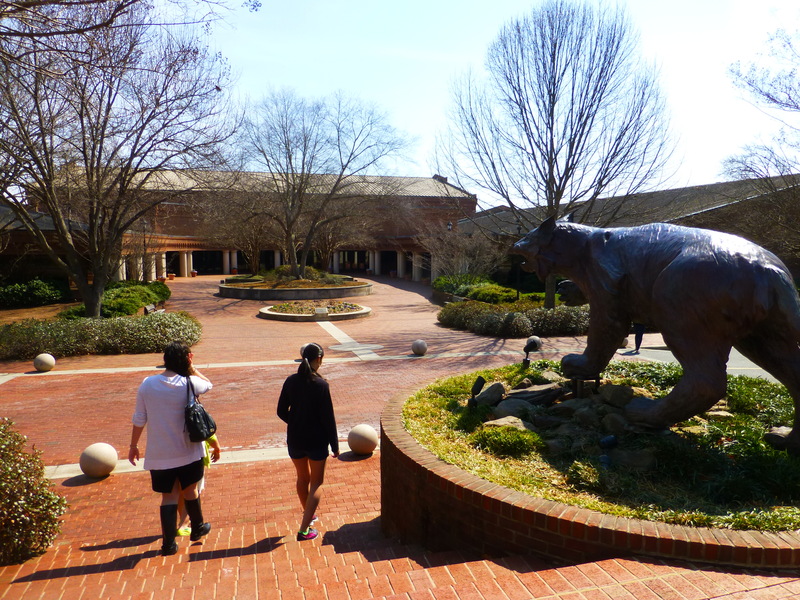 They thrive here,” said an admissions rep. This year, they’re bringing in 826 freshmen from 26 states and 11 countries. “Students who are looking for a Villanova feel but maybe don’t have the grades will probably do great here,” said our tour guide. 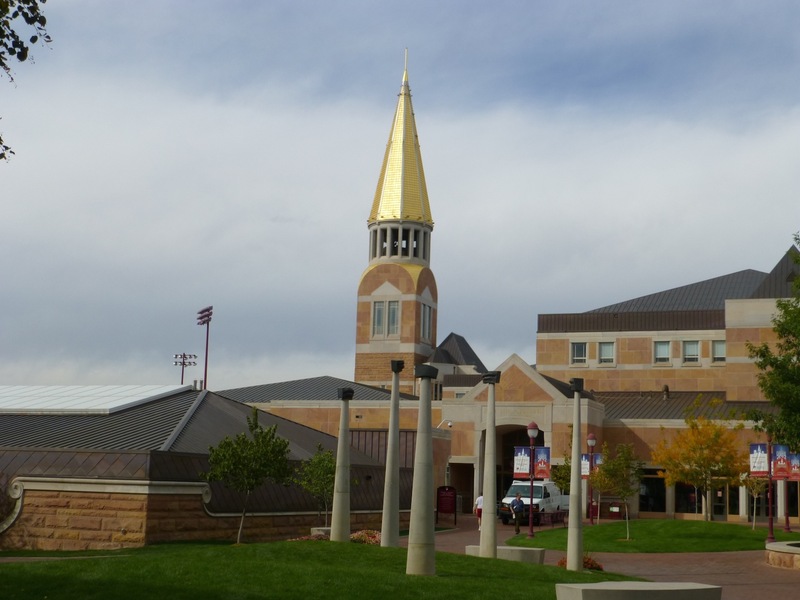 Currently, freshman to sophomore retention is at 78%, but they’re working to get it to 85%. They just hired a new person who can work with “those kids that all schools miss,” an admissions rep told us. 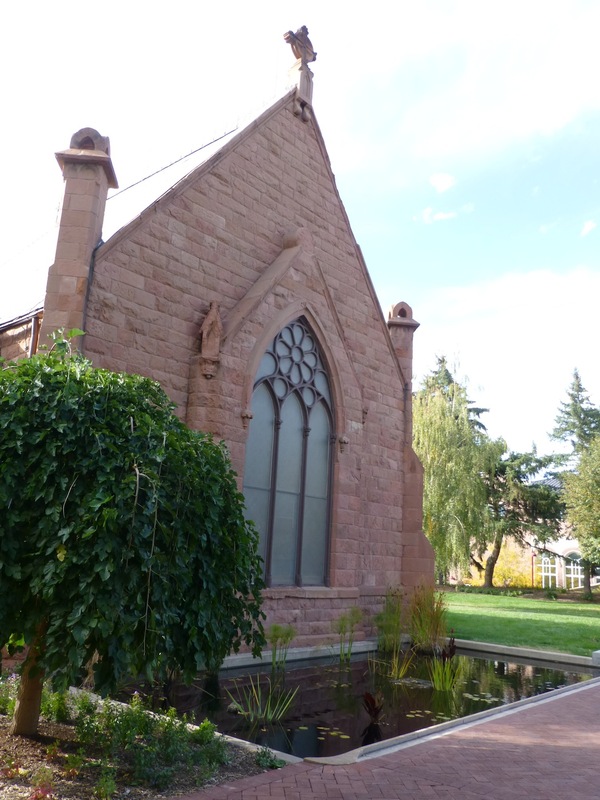 This is 1 of 6 Christian Brother colleges in the US. Part of the Christian Brothers’ ethos is to work with under-served students. More than 50% of La Salle’s students are First Gen and about 35% are PELL eligible. Serving people extends to the wider community, as well. A Community Service requirement is tied to the major. About 35 Brothers live on campus, and many teach and work there, as well. (As a side note, they’re building a new retirement home on the edge of campus because “Brothers live forever. It’s a known fact,” joked our tour guide.) Our tour guide had a business class with one, and another works in Admissions and is charge of all the CB high school applicants. He talked to us and said that Community separates them from other schools. They’re part of the school, Philadelphia (“It’s our largest classroom”), and the CB community worldwide. Students eligible for the Honors Program are pulled during the admissions process based on GPA and test scores, but students can apply separately if they want to be considered. These students take an interdisciplinary Philosophy, History, and English class for all year. After freshman year, they have honors electives. Normally 2 philosophy and 2 religion classes are required, but the honors electives fulfill that. In addition to the typical majors you would expect at a medium sized school, a few unusual (and most interdisciplinary) ones stand out: Integrated Science, Business, and Technology; Political Science, Philosophy, and Economics; Economics and International Studies; and Business Systems and Analytics. This is the first school I’ve heard of that does completely random lottery selections for class registration; seniors might be last to register. Class sizes are pretty typical for a school this size. There are 3 lecture halls on campus which hold about 100 people; big classes have tutors and supplemental instructors. English classes are capped at 18.
International Students can take advantage of the English Language Institute and/or additional support with the English. Regular Admit: Students need an 80+ score on the TOEFL can enroll without the extra support. Pathways: First year students with a 65-79 TOEFL will receive tutoring and extra support as they start their classes. ELI: This is a Conditional Admissions program for students without at least a 65 on the TOEFL. Students can enroll in ELI to gain proficiency and have to reach level 5 for undergrad or 6 for graduate work. About 80% of freshmen live on campus. Housing is guaranteed all 4 years; some students do move off campus, but many stay. 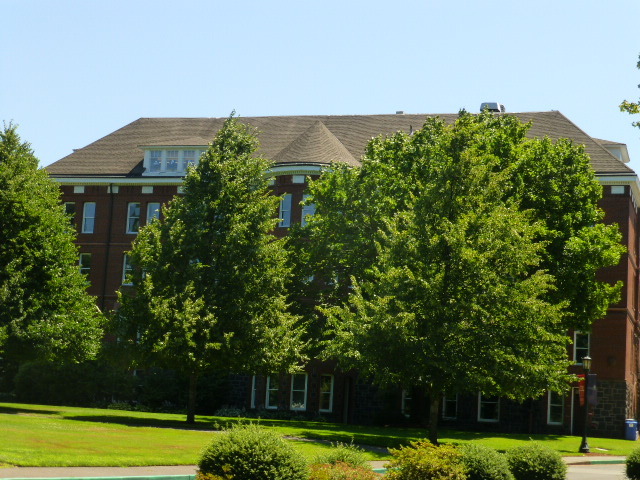 North Campus has most of the freshman dorms along with some singles usually taken by upperclassmen. La Salle just put up a new dorm with mostly suites interspersed with some doubles. There are 5 frats and 5 sororities but no Greek housing. Students like the dining options. Their DI sports are strong here. There is no football team (except for an intramural, non-tackle team), but they have all the typical sports as well as water polo and crew for both men and women. They have lacrosse for women but not men. Rugby and softball are new. All events are free for students to attend. This is the first university I’ve visited that has power tools, sewing machines, soldering irons, 3D printers, and more in the library for students to access. They have a whole innovation lab in the library at the students’ disposal. I enjoyed Stetson and can see why students are drawn to it. 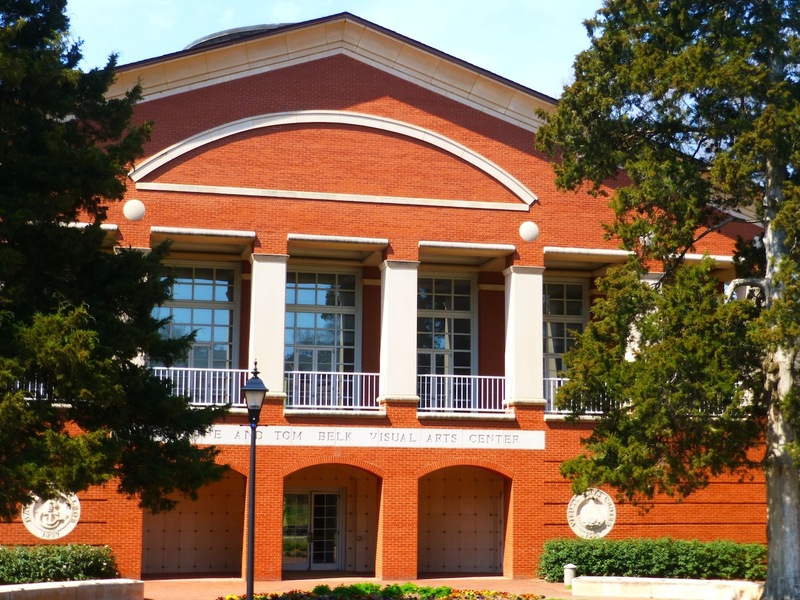 People are friendly, the campus is attractive, and its ranked Top 5 Universities in the South by USNWR. It’s a small school with a big school feel. Even the town of DeLand (just north of Orlando) was named in the “Top 3 Best Main Streets in America” by Parade Magazine (www.destinationdeland.com). Stetson is growing, currently with just over 3,000 undergrads. About 40% of students come from outside Florida, including 185 students from 55 countries. They make it easy to get to and from campus with airport shuttles. They’ve added dorms to keep up with the demand: there’s a 3-year residency requirement, but most seniors stay on campus with 86% of students on campus. Almost 1/3 of students go Greek; housing is available but limited. This is an animal-friendly campus; we saw several dogs around campus, and a student had a dog with her in the library as she was studying. There is a friendly, family feeling here. Students talked about lots of traditions such as the candle ceremony at the beginning of the year where freshmen carry a candle through the original gates. All students need to accumulate 24 cultural credits to graduate. These can include anything from watching a debate and discussing it, attending any of events at the music school, or going to a lecture by a visiting academic. “It’s easy to do. 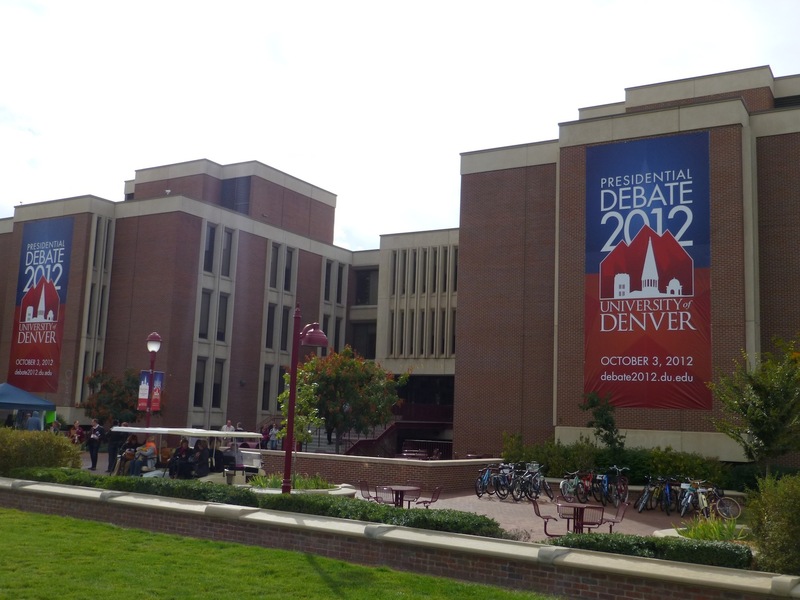 Most people go to these things anyway, and most of my friends are done with their 24 events well before the end of sophomore year.” This is a highly engaged campus in many ways including with high voter turnout. The political divide is almost equal: 32% democratic, 28% republican, 18% independent. Whatever political side you lean towards, it’s ok here. 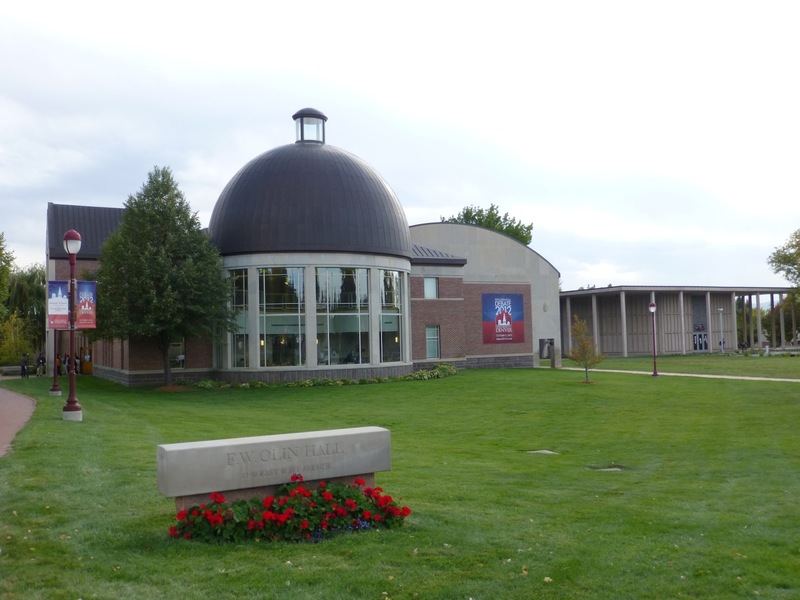 The School of Business Admin is accredited in both business and in accounting. The Roland George Investment Program got 110 applications last year for 25 spots. It’s a 4-credit class; “25-40 hours a week is a conservative estimate of the time commitment.” All majors are welcome, but “business is heavily represented – and occasionally math,” said a student we talked to in the room (which is limited access – they have to swipe a card to get in!). Their School of Music is impressive. They take 80 students per year and graduate 55-60. Many change majors but stay at the university. They’re encouraged to dabble early if they’re interested because it’s so heavily proscribed – it’s easier to move out than in. Everyone majoring or minoring need to audition and must be admitted to both the university and the music department. Because it’s a school of music and not a conservatory, they can be accepted at several levels (for a minor but not a major, etc). They can also audition for entry during their freshman year. About half of the students go into music education; they’re in very high demand. 50% graduate in performance or composition. There’s no marching band (no football team!) but the students can get experience working with a local high school that has a 400-member marching band. Many students Study Abroad, and those who do a language immersion can complete a minor in 1 semester or a major in 2. Students in the Honors Program can design their own majors by combining any passion and interest; their degree is whatever they label it as. One student combined Art, Art History, and Chemistry to make an Art Restoration major. Students live in honors housing, receive a $2000 stipend for travel or research, and are exempt from many of the gen ed requirements. Students admitted to the honors program average 31.5 ACT or 1410 SAT. They like a 30 ACT and at least a 600 on each of the SAT sections. The Bonner Program brings in 18 students each year as a cohort; this is reserved for people with a true passion for community service and engagement. The application deadline is Feb 25 with the finalists invited to campus later in the spring. All students complete a research project. Their major will determine the type of research they do, but there’s always an oral presentation component. A Senior Research class gives them some time and structure to do this as needed, but there are multiple opportunities outside the class to do the research. Admissions is test-optional. If students choose to submit their scores, Stetson will superscore the SAT but not the ACT. They will recalculate GPA (.5 to Honors, 1 point to AP and IB). Students who visit get their application fee waived, and 0ut-of-State students get a 1-time $1,000 travel scholarship. International applicants can have the TOEFL waived if they completed 3 years in an English-speaking school; otherwise, they need a 79 on the test. Students are automatically considered for Merit Scholarships up to $33,000. Music scholarships are done separately and require an audition; the deadline is 2/25. Non-majors are welcome to apply. Scholarships for DI athletics and ROTC are also available. These are stackable with merit scholarships. The J. Ollie Edmunds Scholarship awards 1 full-ride scholarship each year: students with a 3.5 GPA are eligible to apply. They usually get about 350 applications for this. Four finalists are selected from this pool to come to campus to interview. The winner gets everything paid (including fees) plus 2 study abroad stipends. Additional scholarships for those qualified for the JOE scholarship include one for Humanities, Environmental Sustainability, Writing, and Business Systems and Analytics. Making me who I am. The people. I had a question for a professor who couldn’t answer it right away but had an answer in my email by the next day. Lots of connections with professors and the alumni. Being welcoming. Sometimes change is hard. They did a good job at making the transition easier. People reach out. Everyone has a hard transition but no one admits it. Everyone has that moment when it clicks and you know you’re supposed to be here. The support is here. Expecting us to step up into leadership positions. I had a wakeup call with academics. You might have been the best student in High School, but they expect a lot here. I had a 20 page paper due but never wrote one longer than 5 before. I wasn’t getting the grade I wanted, but the professor met with me in the coffee shop and worked with me. The writing center is there. You can do it. I was impressed with UP’s campus and the people. The students were eloquent without being forced, and six of them were willing to come in on a summer Sunday afternoon to eat lunch with us, give us tours, and sit on a student panel. Two notable programs are Direct Entry Nursing and Direct Entry Engineering. Students remain in the program as long as “you don’t give them a reason to kick you out” by failing a class or getting into serious trouble. A nursing major ate lunch with us; during the first two years at UP, some of her distribution classes were Nursing-specific such as microbiology and stats. Clinicals start in junior year (“8 am classes seemed really early until I had 5 am clinicals!” said our tour guide), and students stay over the summer between junior and senior years to continue clinicals so they can graduate in 4 years. We asked our tour guide if she felt that she missed out on meeting people in other majors, or if the program felt too small. Her interaction with others has lessened as she moved up in the major, but she took her early classes with people from all majors and she participates in clubs and lives in dorms with people from other majors. Professors are supportive and want students to do well; education is hands-on, starting with small classes. Nursing has simulation labs with fancy, expensive mannequins. The new Engineering Building provides hands-on lab space. The business program has a class that lets students invest $10,000; many of the business majors (and some others) will intern with Nike or Adidas which are headquartered in Portland. All students must complete a capstone experience before graduation. Clinicals count for the Nursing Capstone; others will do original research with a professor or another major project. The school deliberately builds community starting with a Freshman Workshop; students get involved and included right away. They get a call from their upperclassman leader (usually someone in the same major) over the summer. The group meets once a week for an hour, talking about everything from using Portland’s public transportation to how to study in college. Secondly, students can’t have cars their first year which encourages them to take advantage of the campus and city offerings. Finally, all freshmen live on campus in mixed-level dorms that helps everyone get to know each other and learn as a community. There is no Greek life, so social life revolves around dorms and all-campus events. By junior year, about half the students move off campus; it’s cheaper and people like the increased independence. 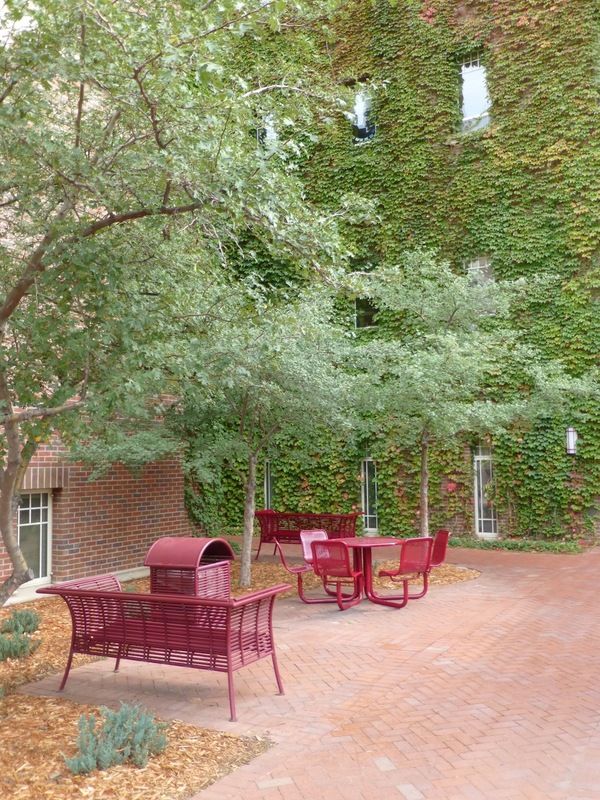 Off-campus housing is close and easy to find. UP has built new suites and apartments, but many dorms are traditional. Our tour-guide lived in one of these her first year, and she liked it, especially the sauna and a pottery room in the dorm. This same dorm has a bomb shelter in the basement which is ironic since the building is shaped like an X: “The architect obviously had a sense of humor.” Wi-fi isn’t always so strong in the dorm, requiring an Ethernet cord sometimes; this is one of the few things that the tour guide wanted to change about the school. 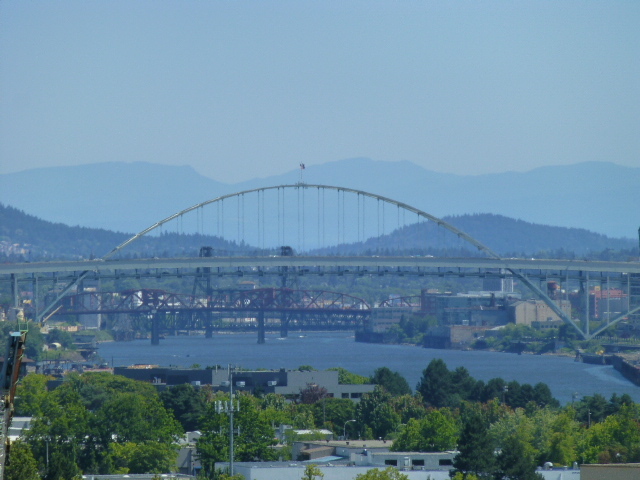 It’s easy to get around Portland for internships and activities. 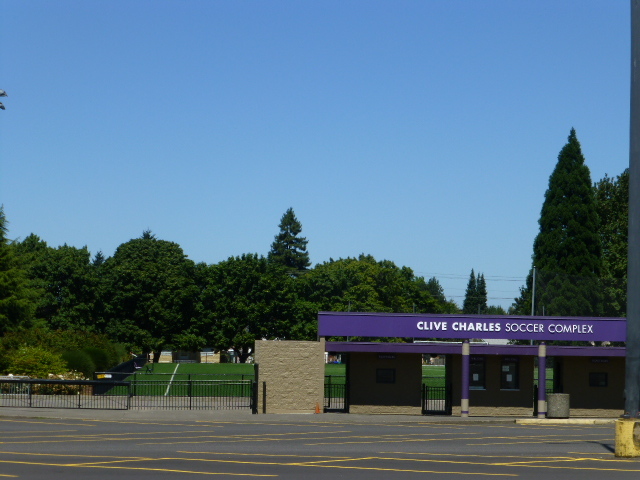 The school owns several cars that students can use for free, and they run frequent shuttles. 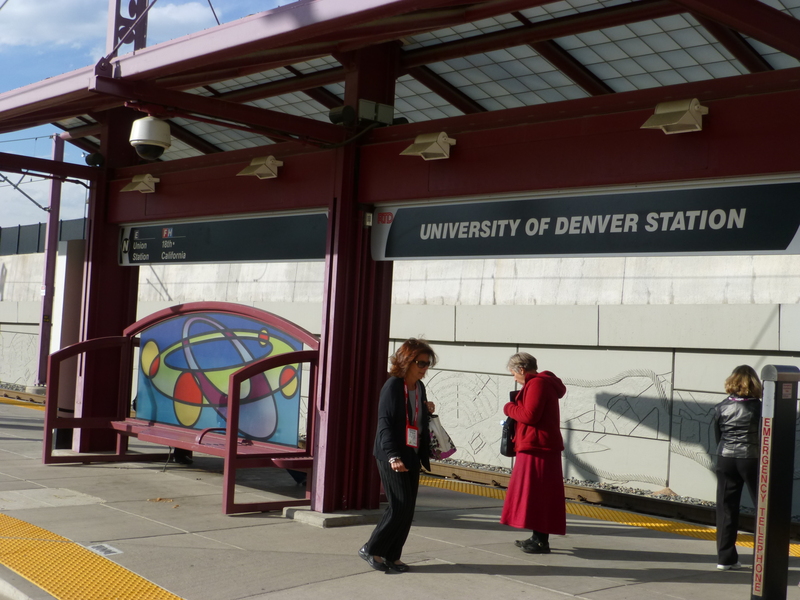 For $2.50 (less if bought from Campus Security), students can get all over the city on Light Rail and the bus system. The school offers subsidized tickets to sports, theater, and more, including $10 tickets to see Wicked and Beauty and the Beast. 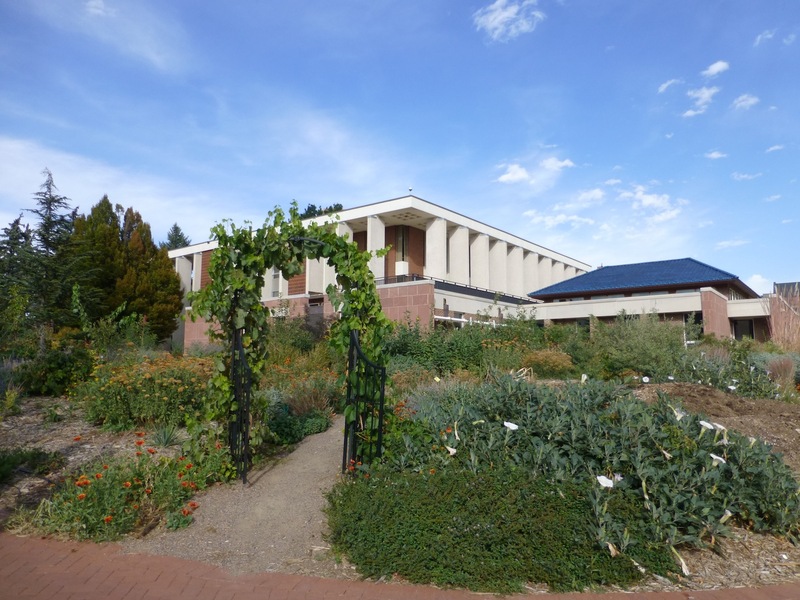 However, students say there’s so much to do on campus that they don’t need to rely on town for their entertainment – but they do appreciate that it’s there. UP is ranked #1 nationally for service (and 3rd leading school – of schools their size – providing Peace Corp volunteers), with students exhibiting a strong ethical responsibility and social justice. A favorite annual event is the “Man Auction” in which members of a social fraternity auction themselves off for charity. Our tour guide works with a center that hooks her up with things in town like the Food Justice Fund, a hospice program, and more. Some of the “Plunges” (chances to immerse – or plunge – into a certain activity) revolve around service and/or education: going to the Mexico/Arizona border to learn about the immigrant experience or building a Habitat for Humanity house. The pre-orientation Plunge for incoming freshmen is very popular; they spend several days in Portland completing community service with a small group. Students are inclusive and accepting towards all groups. For example, there is a fairly large gay population, and last year, students held Purple Pride in which they fought to have GLBQT issues addressed by the administration; this was well received by students and staff alike. Study abroad is a major deal here, and they make it relatively easy to go. Language majors must study abroad in a country speaking that language. UP also offers a specific study-abroad program for nursing in Australia in Perth. Our tour guide studied abroad at the University of Grenada where she took all her classes in Spanish. Salzburg is the “flagship” for study abroad. Only 40 students get selected though a rigorous process including interviews in sophomore year. They go all year and travel throughout Europe. UP takes the Common App. Although admissions is rolling, the class usually fills by December even though the deadline is in January. The school is approximately 40% male (with this year’s freshman class at 44%) and has 25% self-identifying minority students. Merit scholarships are based on numbers with an average GPA of about 3.7 and 1200 SAT (CR & M) for scholarship winners. There are 7 Providence Scholars winners (5 for freshman, 2 for transfers) which pays academic expenses; students are guaranteed a job for 2 years (essentially trading service for the scholarship). There are talent scholarships in drama, music, and athletics; these students must audition or send in a DVD. The performing arts department isn’t huge, but puts on about 4 shows a year. 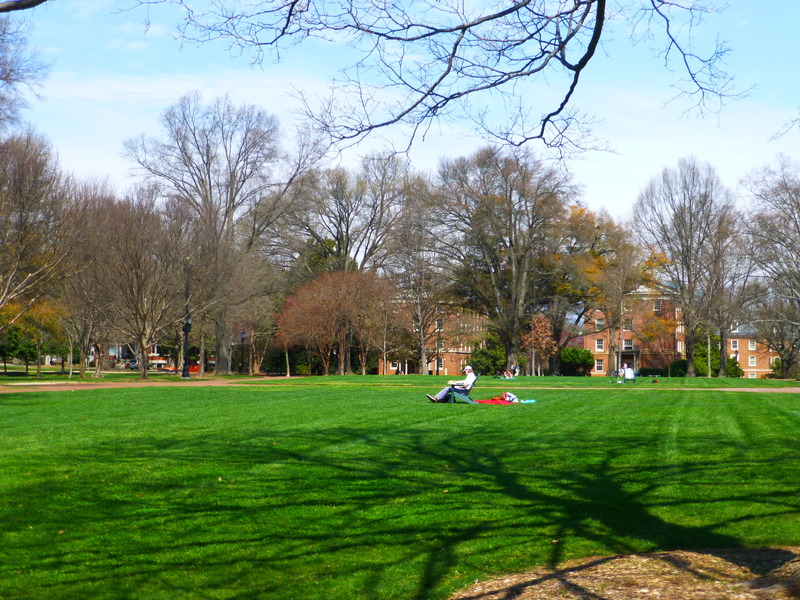 I wish I had visited Davidson sooner. I was highly impressed with the campus and the opportunities available to students. It’s unfortunate that it isn’t on more people’s radars. I had heard a lot about it after moving to the state, and I finally had a chance to bring some students for a visit on the way to a College Fair. 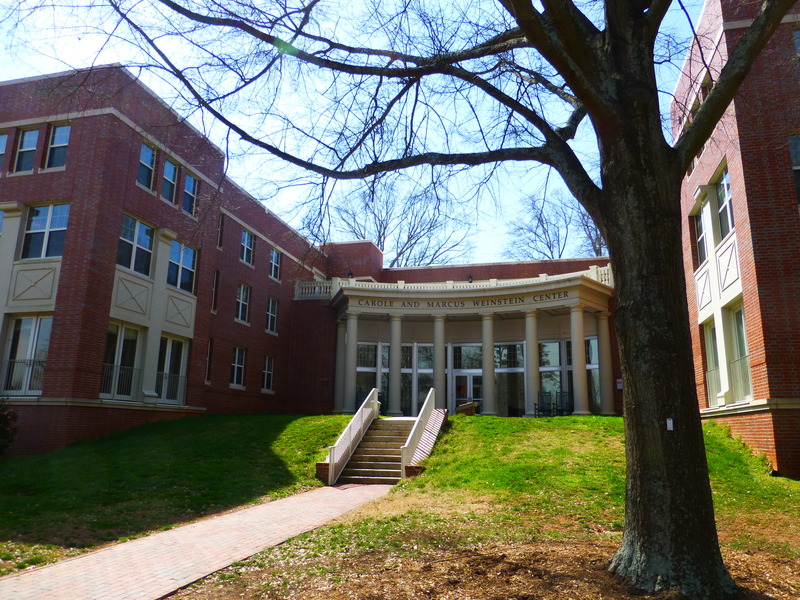 This selective school of just under 2,000 students sits on a beautiful sprawling campus in the city of Davidson, about 20 minutes outside of Charlotte, NC. We visited on a Sunday when the admissions office was closed, so a student from Hillel gave us a tour and took us to brunch. Although there weren’t a lot of students in the dining hall when we first arrived a little after 11, it was getting busy by the time we left a just before noon. The food was excellent and there were plenty of options. The student we were with said that the line to swipe in can be long during the busiest times, but it moves quickly. The “make your own” stations can take some time to get through because the food is made fresh to order. The most popular stations are the noodle and the omelet bars, but any of the hot food is good because of the variety offered. They’ll hold international theme days (Singapore, Russian Culture Night – including dancers, Peru, etc) which students really like since it’s different. The Thanksgiving Dinner is also well attended and tends to be a highlight of the year. 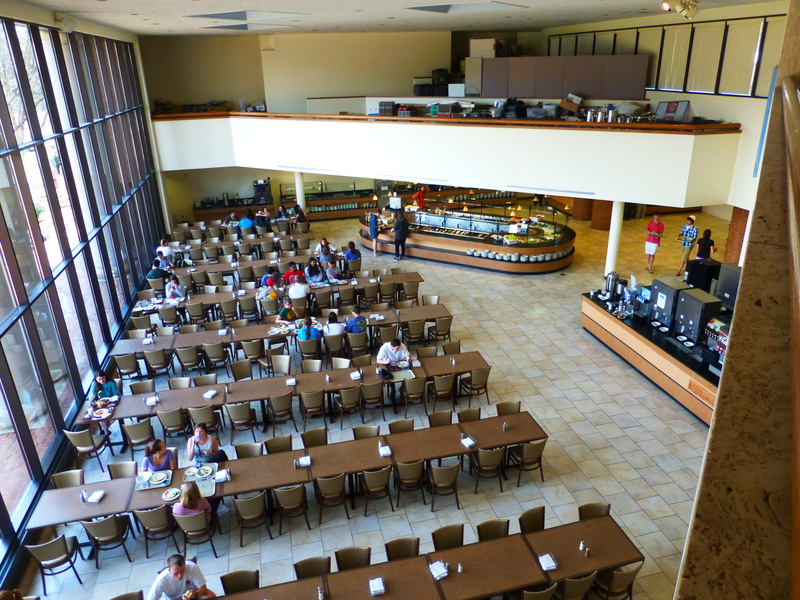 Since the campus is small enough, they only have one main dining hall, but there are a few other dining options on campus. The Davis Cafe in the Union is available for late-night food (it’s open until midnight), and the Cats Den in Sports Center is open for lunch (mostly sandwiches and other “grab and go” options). Also, instead of fraternities or sororities, they have “Eating Houses” which give students a group to join. There are several small houses with kitchens where members can go eat, giving them a small social group to connect with. The multi-cultural House also has a kitchen which groups can reserve, but it has to be educational or part of a recognized group on campus. The sense of community is strong here. Although it’s a smaller school, there’s something for everyone. There’s a lot to do on campus: parties in the quad, movie nights, speakers, clubs that sponsor events (often with food!). A regular email gets sent to students called the “Cryer” which lists the upcoming events including deadlines for grants, internships, summer opportunities, and other similar things. Tables get set up across campus to provide information about everything from clubs to special events to offices (such as Religious Life) on campus. It’s easy to get off campus since the college runs shuttles. Wi-fi is everywhere so students can work outside. 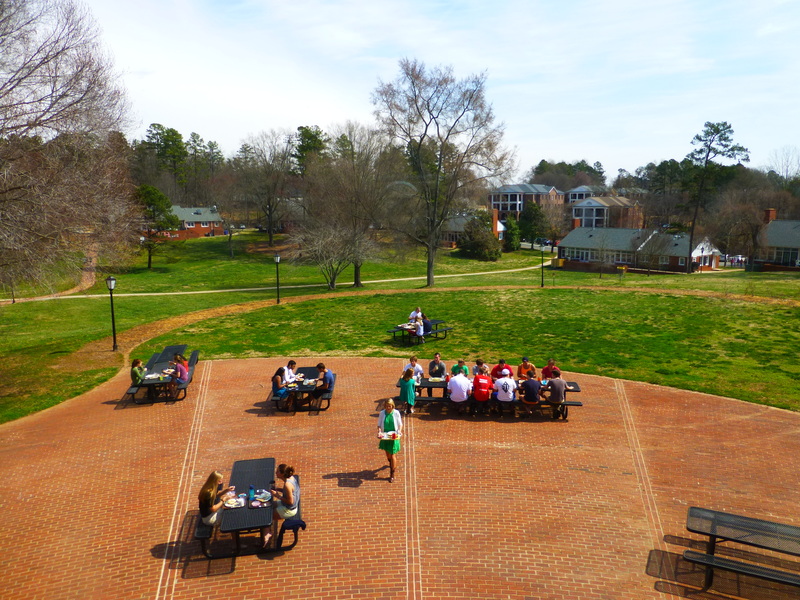 Tables and chairs are everywhere, and students were all over on campus utilizing them. They even had tables with umbrellas for shade near the large outdoor stadium. I image those are highly sought-after on game days! Their entire athletic complex is impressive. Davidson is a DI school which surprised me since they’re so small. Their freshman dorms are traditional style with bathrooms down the hall, but each room has its own sink. People work hard to create a feeling of community within the dorms, both formally and informally. Our tour guide said that during orientation week, one of the activities was a cake race. Everyone in the hall brought back the cakes they won and had a social. After the first year, students can choose from a variety of dorm styles, including suites. There are also other types of living halls, including “Sub (substance) Free” halls in which residents pledge not to bring in alcohol or come back drunk. New sophomore dorms have kitchens on each floor which other students can use, even if they don’t live there. Most students live on campus, but there are apartments right across the street from campus in which about 100 students are granted permission to live through an application process. All students are allowed cars on campus allowed; parking costs $50 for unlimited parking or $25 for the lots far away. Cars aren’t necessary, though, since campus is in town and things are accessible. The college will run shuttles to the Lake Campus daily and to the Charlotte airport before and after breaks for $30. Lots of students will bring bikes on campus, especially those living in the upperclassman dorms located on the outskirts of campus. Classes are kept small here; even as a freshman, our tour guide’s largest class (a music class) had 23 students in it; her smallest (Chinese) had 8. 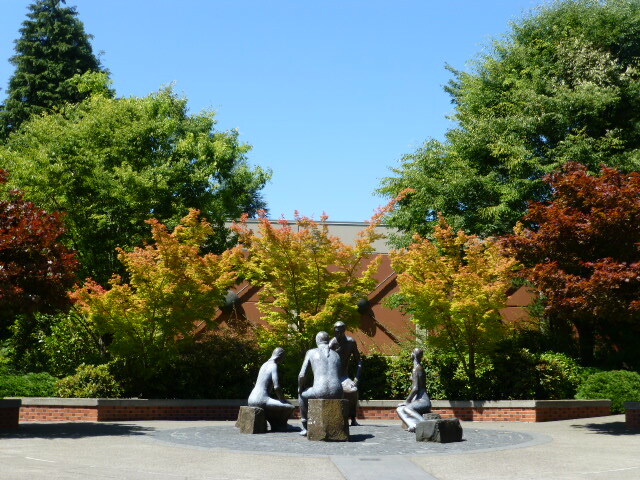 Even though this is a small campus, students are not limited to the academics which they can take. 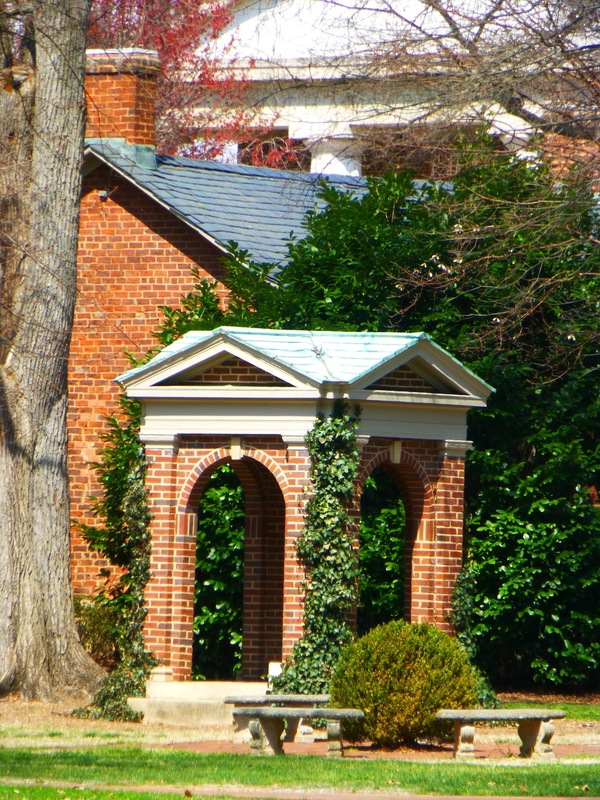 The Charlotte area has a consortium of colleges (including UNC-C, Queens, and Belmont) at which students can cross-register with the approval from the Registrar. 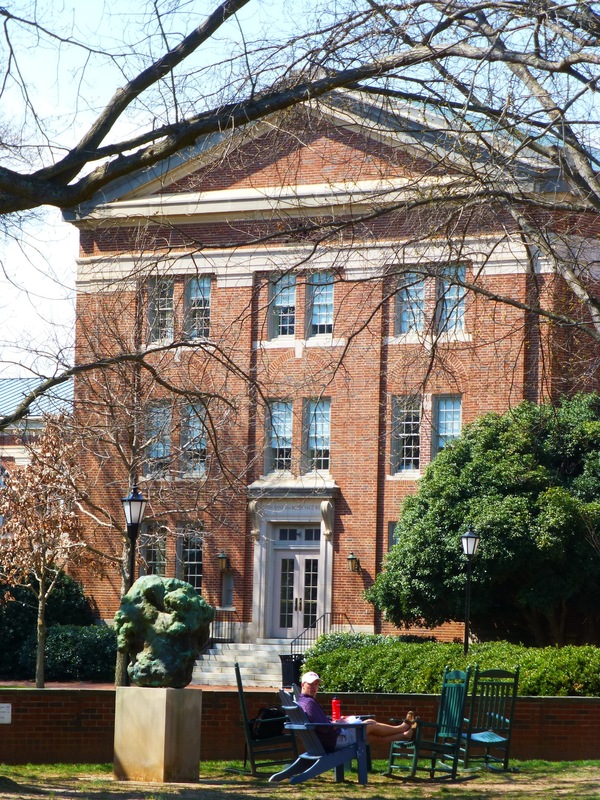 This is easy to do if the class isn’t offered at Davidson, but harder for more popular subjects like History. 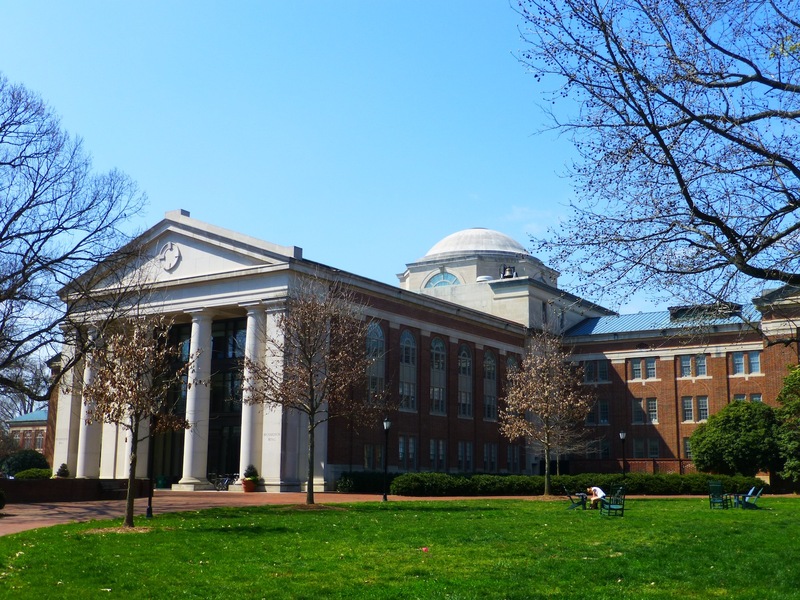 Additionally, students can do independent studies for some languages that are less common and aren’t offered – although Davidson does offer a lot, including Chinese and Italian. Students do have a language requirement in which they have to successfully complete three semesters (through 201) of a language, but they can place out if they come in with enough competency. Other requirements include a class in Cultural Diversity, Religion and Philosophy, Social Science, Math, Science with Lab, and English. All freshmen take a Writing Comp class that has some sort of theme (Memory, Gender, Music and Literature, Revisiting the Library – about history and archives), and they’re taught from professors from all disciplines (history, religion, anthro, etc).